It seems like only yesterday I was walking down that green, green field, my arms erupting in goosebumps as I listened to our marching band try valiantly to perform “Pomp and Circumstance” loud enough for everyone to hear. If I close my eyes, I can still feel the sun warming my skin and the breeze blowing my hair and tassel out of my face. I can still hear the cheers of the crowd and the excited chatter of us soon-to-be high school graduates. I can still see the 535 graduation caps flying up in the air at the end of the ceremony and still see the flash of a thousand pictures snapped in the dying twilight. But between yesterday and today my whole first year of college has passed, a year that without a doubt has been the best of my life. So much has happened, and time went by so fast that I feel like I didn’t get a chance to properly reflect on how much has changed in those 12 months. How much I’ve changed. For the first time in my life, I feel myself becoming the person I want to be, the person I was meant to be. Many people don’t realize it at the time, but the summer before freshman year is basically the most stress-free summer you will have in your entire life. For many of you, high school summers have been about Getting Experience To Show Colleges You’re Not Lazy. So they’ve been filled with internships, research, summer programs, and the like. And that’s great. But college is an academic experience unlike any you have experienced before. And it’s tough. So do yourself a favor and relax this summer. Explore what your hometown has to offer. Spend time with your friends. Spend time with your family. And most importantly, eat as much home cooking as you can, because ain’t no dining hall ever gonna match up to that. 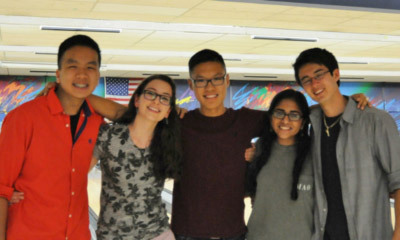 My friends and I enjoying some post-graduation bowling! I already wrote about choosing a major and how important it is not to limit yourself your first year of college, so I won’t add much to this one. I’ll just say this: I started out as an International Studies major with a possible minor in Math. Now, I’m a (declared!!!) Computer Science major with possible minors in Robotics and Computer Integrated Surgery. Talk about a 180! And I wouldn’t have made such a drastic change if I hadn’t taken math, engineering, and computer classes my freshman year. Seriously, guys. I know college is stressful, and I know that grades are important, and I know that getting that glittering 4.0 takes time and energy and effort. But despite what many students believe, joining extracurricular activities on campus doesn’t take away from that. College clubs and student groups might seem like a distraction, but they’re a totally necessary and useful one! They prevent you from going insane every night in the depths of the library, they pretty much force you to get organized and be efficient, and they can teach you important things about your major and future career. But more than that, they give you a community, a group (or groups!) of people who will support you in your time of need. 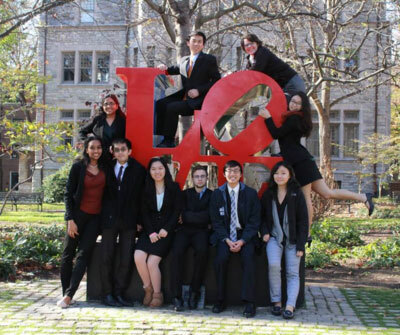 I don’t know what I would have done without my a cappella group or my mock trial team, the people who pulled me through midterms and finals and illnesses and everything in between. To call them my best friends is an understatement; they are my family, my home away from home. Some people go to college and immediately get involved with the things that they were doing in high school. It’s fine to continue a couple of activities you were passionate about during your first year of college. But also keep in mind that this is basically the last time in your life where you are not just free but expected to explore, discover, and learn, with few things standing in your way. Take advantage of that freedom and step out of your comfort zone! Second semester, I joined the JHU Blue Key Society, which organizes campus tours for prospective students. I am normally very shy and not super comfortable with public speaking, so I wasn’t sure if I’d stick with it. But now the hour I spend giving tours each week has turned into one of my favorite blocks of time. I love interacting with prospective students, and I’m now comfortable speaking in front of large crowds, a valuable skill in the real world that I wouldn’t have gained otherwise. On my first day on campus, it took me half an hour to find the Breezeway (where I’m standing). Now I’m a tour guide. Go figure. The first day of school is always a little stressful, but never more so than on your first day of college ever. Getting to know the campus ahead of time takes the edge off. The night before classes started, my friends and I charted a course on our handy-dandy campus map and walked from building to building to make sure we knew where everything was—10/10 recommend. This is probably my most important piece of advice for all incoming freshmen. In high school (my high school, at least), tutoring services and asking teachers for help is often considered embarrassing. Well, high school was easy, folks. College is hard. You’re going to need help at some point, and there’s nothing wrong with going to the professor’s office hours and asking for clarification. In fact, you’ll probably find several members of your class in line with you! College is distracting too. It’s your first time away from home, and there are clubs and parties and no parent supervision, so it’s hard to keep up with your work and still have fun. But there will always be opportunities to have fun. Your GPA will be set in stone—and it does matter for internships, grad school, and even some real world jobs. Don’t be the freshman failing Calc II because you were at a frat party until 4:00 am. You and your parents aren’t paying for you to party all night. Stay on top of your work, plan your time, and don’t go overboard. They love you. They miss you. They’re not having all the fun you’re having, and they’re waking up to a quiet house every day. Do Mom a favor and call her a couple times a week, and text Dad and let him know you’re alive every few days. This goes for many things, from joining campus clubs and Greek life to relationships and hook-up culture. Stick to your beliefs and do what feels right for you. Don’t want to hook up with a random stranger at a frat party? Don’t! Don’t want to rush Alpha Phi? Don’t! Don’t want to date your freshman fall? Don’t! Just make sure they’re your decisions, not your friends’. You’re the only one living your life. College—and life—is too short to waste time on things you don’t enjoy. You only have four years on campus. As I’m sitting here writing this, I’m still processing the fact that I’m already done with freshman year—25% of my Hopkins experience. Whoa. Don’t forget to sit outside on the steps of the library on a sunny day, or play a game of volleyball with your friends on a spring evening, or take pictures in the snow during your first blizzard on campus. Enjoy the best four years of your life. You’ll remember them forever. 11. BONUS TIP! 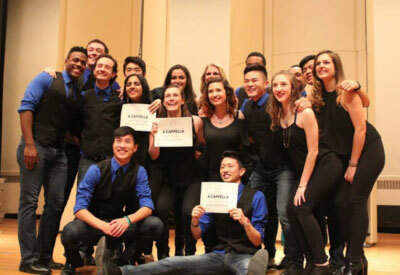 If you can sing, join an a cappella group! A cappella is probably the most defining experience of my college career so far, and it’s a big deal on tons of college campuses. I’ve always been involved in music and voice, and I was a good singer in high school, but joining the JHU Octopodes (check us out on YouTube and Spotify!) and meeting people with so much talent has been eye opening and incredibly humbling. I’ve grown so much as a musician too. My voice is stronger, I’m hitting notes I didn’t know I could hit before, and I’ve discovered The Wonderful World of Arranging. The Octopodes has provided me with many great experiences. This year, we placed first in the quarterfinals of the International Competition of College A Cappella (yes, just like Pitch Perfect) and recorded an album to be released in November. And I now have 16 upperclassmen mentors that I have come to rely on as my family. If you’re on the fence, do it! You won’t regret it one bit. Winning the ICCA Quarterfinal with my 16 best friends definitely felt like a Pitch Perfect moment. What Does Your Favorite Ice Cream Say About You as a Student? 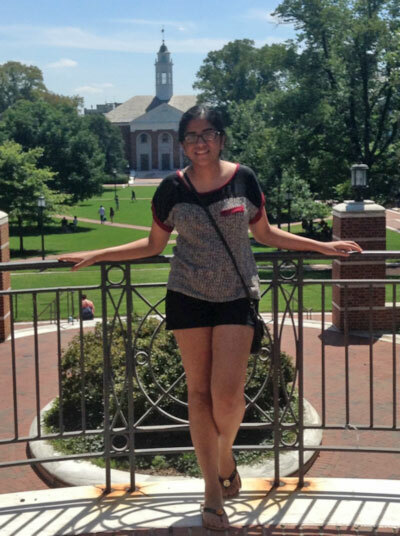 Ramya Prabhakar is a student at Johns Hopkins University. When she is not writing, she enjoys singing, coffee, laughing, and doing things she’s not good at, like bowling or laser tag.